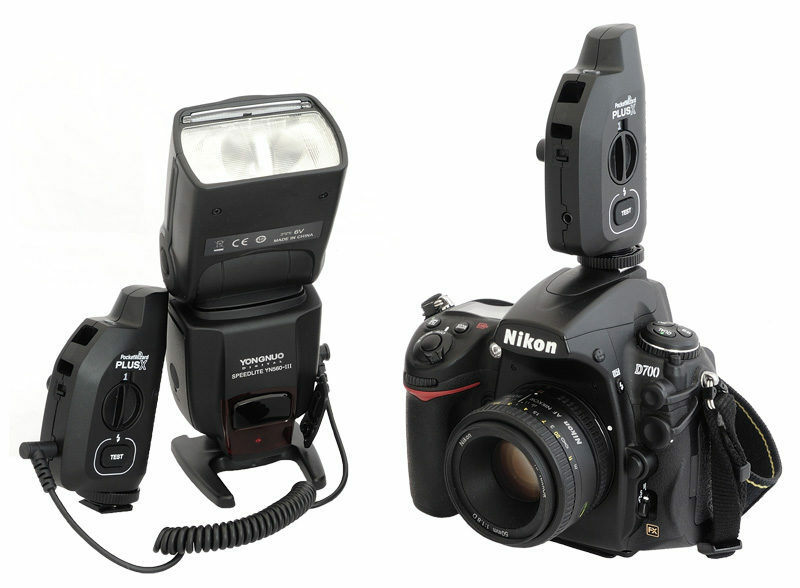 In March, PocketWizard announced their cheapest, "simplest ever" flash trigger, the PlusX. Is it any good? 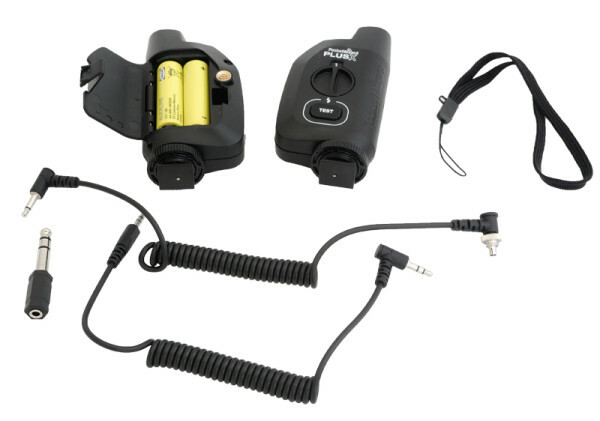 Until about three or four years ago, PocketWizard was one of the only makers of “good” radio slaves and the obvious port of call for any discerning professional. The cheap Chinese “Poverty Wizards”, by contrast, were invariably poorly made, short-ranged and unreliable. Anybody depending on their triggers to fire every time had a clear choice. But the cheap triggers aren’t rubbish any more — some of them even have reputable distributors now — so the company faces some tough competition. In March, PocketWizard announced their cheapest, “simplest ever” flash trigger, the PlusX. Priced at £89.99 (US: $99) per radio transceiver, the PlusX seems to be aimed at tempting photographers away from the cheaper brands and into the PocketWizard ecosystem. For your ninety quid you get the following. If you want to get any work done then you’ll need to buy a set of two (RRP £169.99) or more. The transceiver itself is a Plus III with the screen ripped out and replaced with a twisty, easy-to-use channels dial. The “X” in PlusX represents the 10 different channels, which are displayed by a backlit number on the top of the dial. But there are no more “Quad Zone” groups, no more Two-Stage test button and no more Long Range or Repeater modes. What’s left? There is still a battery level indicator — the Status LED (on top) will change colour as the AAs run down — and there is the Auto-Relay Mode, which lets you trigger a remote camera and in turn sync it with a flash, using only three transceivers. The only competing product I can think of with a similar feature is the Aputure Trigmaster Plus II 2.4G‘s “Interlink” mode. Unlike the Trigmaster Plus II, however, PocketWizard still haven’t got round to making a manual flash trigger with a hotshoe in it. Meaning that you have to connect the PlusX to your speedlight with a sync cable, which I don’t like. Cables are just one more thing to break or lose, and many mid-level flashguns (Canon 430EX II, Nikon SB-700) don’t have sync ports, making them less appealing to non-professionals. Still, it is nice that all the cords you need are included in the box (save for a hotshoe adapter) and there is a lanyard to dangle your trigger without putting too much strain on the cable. 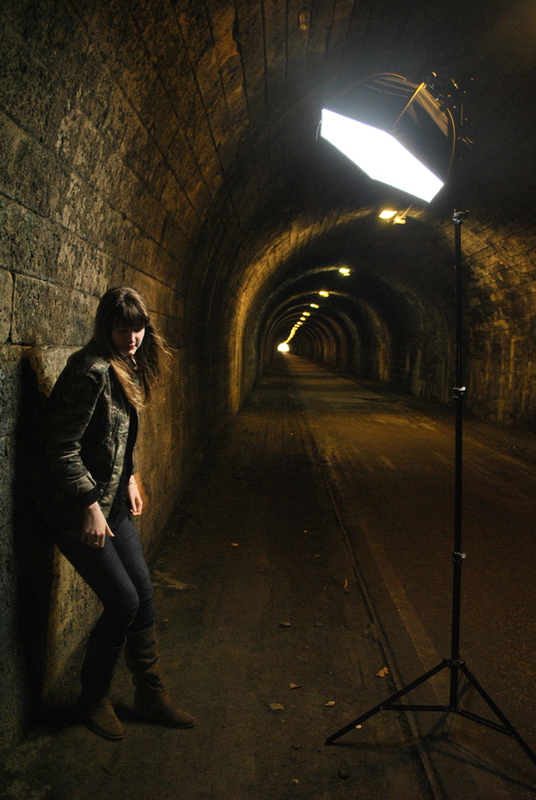 One of the main things PocketWizard has going for it is that many studio lighting systems have compatible radio receivers built in. The PlusX will work with all of these, so that’s something to consider if you have such kit. The design of the PlusX looks quite slick at first glance, but in actual use makes little sense and becomes an irritation. Rather than have the control wheel face the photographer, when mounted in the hotshoe the PlusX actually faces off to the left. So from the photographer’s-eye view (below) you can’t tell which channel is set, nor even whether the device is switched on since the Status LED is blocked by the chunk of black plastic housing the radio aerial. The power switch (on the front) is fiddly to reach by feel as well. Why the controls aren’t on the same side as the camera-top LCD panel is beyond me. I also personally prefer low-profile flash triggers since often you can leave them on your camera all the time, whereas you won’t have much luck putting your DSLR into a bag with the PlusX equipped. Still, it’s not that big of a deal removing it and sticking it in a spare corner of your bag. 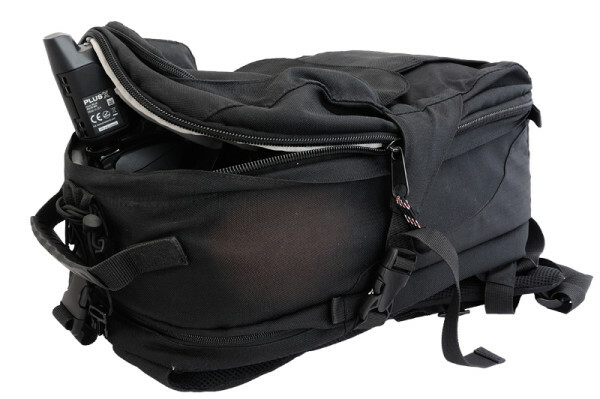 With a big rucksack it seems like the transceivers barely take up any room, filling in empty corners, and it’s relatively quick to mount and dismount them from your camera between shooting. The “Test” button is a piece of rubbish. When I first went hands-on with the device at Focus 2013 I complained that this button was “very squishy” but put that down to it being a pre-production model. Sadly, nothing has changed and the button will even get caught under the casing on every other press. If you’re thinking of getting one of these for a remote shutter release, I’d advise you to steer clear. So I am not the biggest fan of the hardware. But how is performance? The triggering delay is imperceptible on a conventional focal-plane-shutter DSLR camera. My Nikon D700 achieves clean synchronisation at 1/250 second shutter speed, the maximum for this camera (short of using high speed sync or HyperSync, which the PlusX as a transmitter doesn’t have). With other types of shutters, such as those found on compact cameras, the maximum sync speed will be higher. PocketWizards are renowned for their strong signal performance and the PlusX is no exception. The manufacturer specifies a range of “up to 500 metres” in ideal conditions. Even in the full force of Scottish summer weather (fog and rain) through rocks, bushes and people (all things that the instruction manual advises you to avoid) the PlusX triggered the flash reliably every time I hit the shutter. 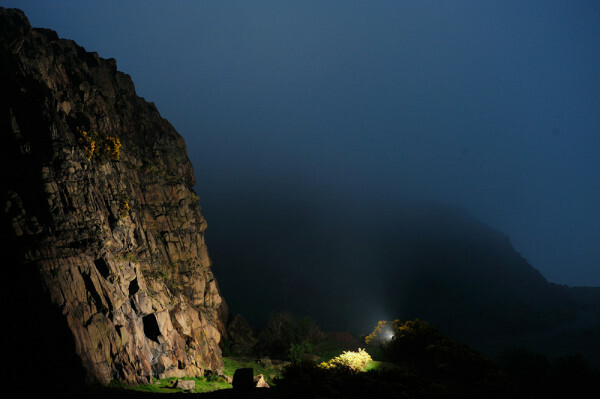 It allowed me to produce some long range “illuminated landscapes” on Edinburgh’s Salisbury Crags, shown below. More typical scenarios are likely to involve shorter operating ranges, with interference rather than distance being the primary concern. 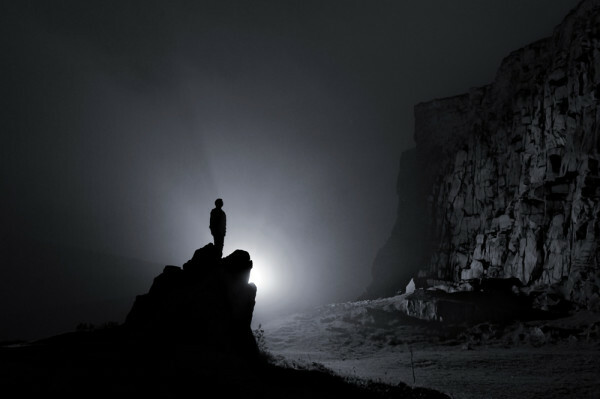 Even in damp environments and rooms full of WiFi routers, the PlusX didn’t fall short. If you’re pushing your equipment to the edge, your camera or your lights will very probably reach their limits long before these radio triggers will. In conclusion, then, the PlusX makes up for in performance where it falls short in hardware design. While a little bit irritating to use and set up, it is hard to argue with the raw performance. 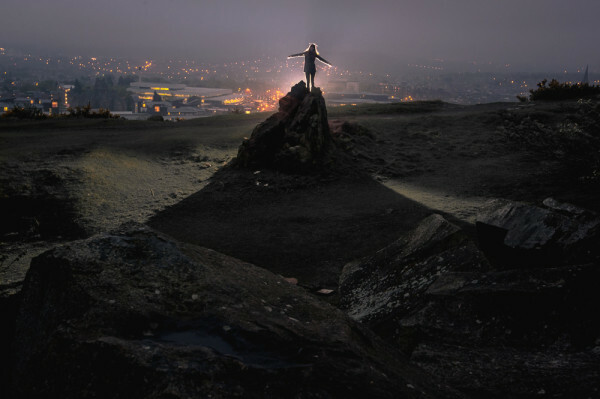 That said, newcomers will find it very easy to argue with the price, which is simply not competitive with the competititors, even relatively high-end ones such as the Aputure Trigmaster Plus II and Phottix Strato II Multi, which cost less and offer decent performance and extra features such as wireless grouping. The PlusX is almost like a Plus III without a USP. So who is the PlusX really for for? Existing PocketWizard users seems to be the answer. The PlusX is the cheapest way to add to your setup if you already have lots of Plus IIs, Plus IIIs or FlexTT5s and want to add some more manual flashes into the mix. 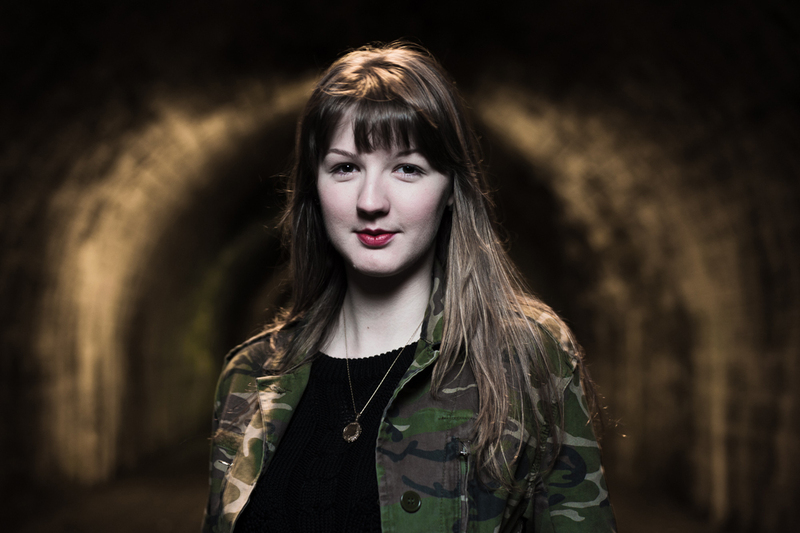 It could also be handy if you (or your colleagues) use a brand of studio lights or flash meters that have PocketWizards built-in. But I don’t, so it seems like the PlusX is not for me. 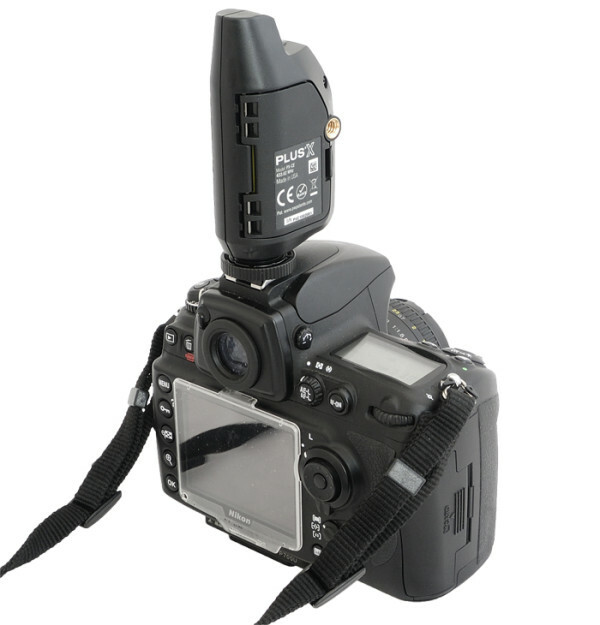 The PocketWizard PlusX is priced £89.99 per transceiver, distributed in the UK by Johnson’s Photopia (JP) and available at most good photo retailers. In the USA it costs $99 from Adorama, B&H Photo, Amazon and other shops, distributed by Mac Group. Thanks to JP for lending us a set for this review. For more technical information, visit PocketWizard.com.